Kaipupu Point Sounds Wildlife Sanctuary is located on an outcrop of land between Picton Harbour and Shakespeare Bay. The sanctuary is a community conservation project lead by a team of dedicated volunteers. Their aim is to created a mainland island sanctuary that protects and enhances our unique New Zealand wildlife. The area is separated from the mainland by a predator proof fence and the only access is by boat. 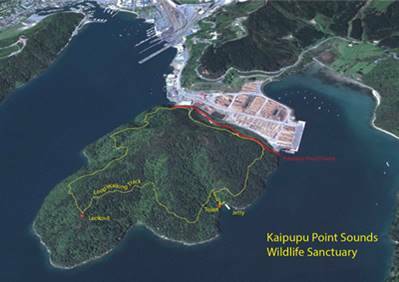 Kaipupu Point Wildlife Sanctuary is managed by a community charity on land co-owned by the Department of Conservation and Port Marlborough.